The National Fire Protection Association’s (NFPA) Fire Prevention Week is Oct. 4-10. NASA Kennedy Space Center takes the safety of each employee seriously. Just how quickly can a fire spread? NASA and contractor employees saw firsthand as Kennedy Space Center Fire Safety personnel illustrated the importance of having fire protection systems in buildings and homes during a live demonstration conducted Oct. 8 in the Launch Complex 39 area. Two small trailers containing typical home furnishings for one room were staged for viewing by Kennedy workers. One trailer was equipped with a smoke alarm and sprinkler system, while the other was not. Fires were set in each trailer to show the difference between having a sprinkler system and just how quickly an unchecked fire can spread in a structure that does not have fire sprinklers. The room without sprinklers was engulfed in flames and smoke in under three minutes, while the sprinkler system in the other room extinguished the fire in about one-and-a-half minutes. Kennedy Firefighters used Fire Engine No. 2 to extinguish the fire in the trailer lacking a fire sprinkler system. The demonstration also showed how having working fire sprinklers in a building allows the needed time to escape a burning building alive. According to Lorrell Bush, executive director for the Florida Fire Sprinkler Association, it can take anywhere from six to nine minutes for the Fire Department to arrive at your home, and that’s after the call for assistance has been received. “People need to make sure that they not only have smoke alarms, but that they are working,” said Jenni Ginsburg, a mechanical engineer in the Project Integration Office on the Institutional Services Contract at Kennedy. 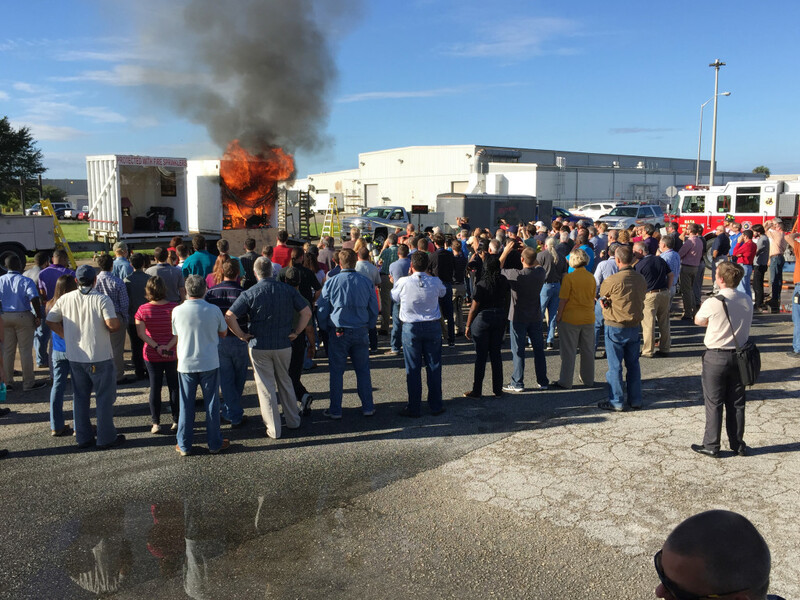 “We hope this live fire demonstration will help people realize just how important it is to have a working fire protection system in their homes and at the office.